Hooked on Needles: 2012 Scrap Afghan ~ HUGE and Getting Bigger! After crocheting and knitting so many projects, the leftover yarn pile becomes so overwhelming that something needs to be done with it. 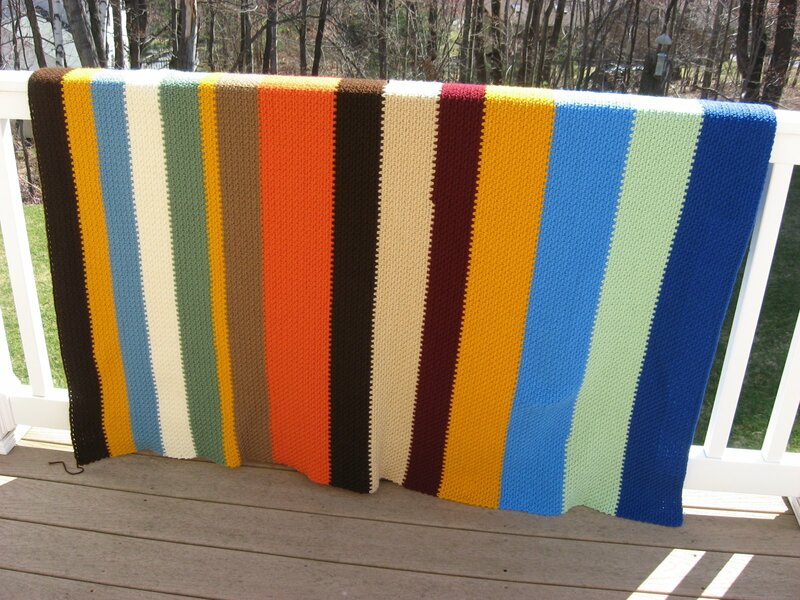 Last year, I took a selection of partial skeins of yarn and crocheted them into a scrap afghan which you can see HERE. Then I started another one with more leftover yarn, using the same woven stitch and using up each partial skein and then just adding the next one to continue. It's a great way to make something useful out of odd amounts of leftover yarn. 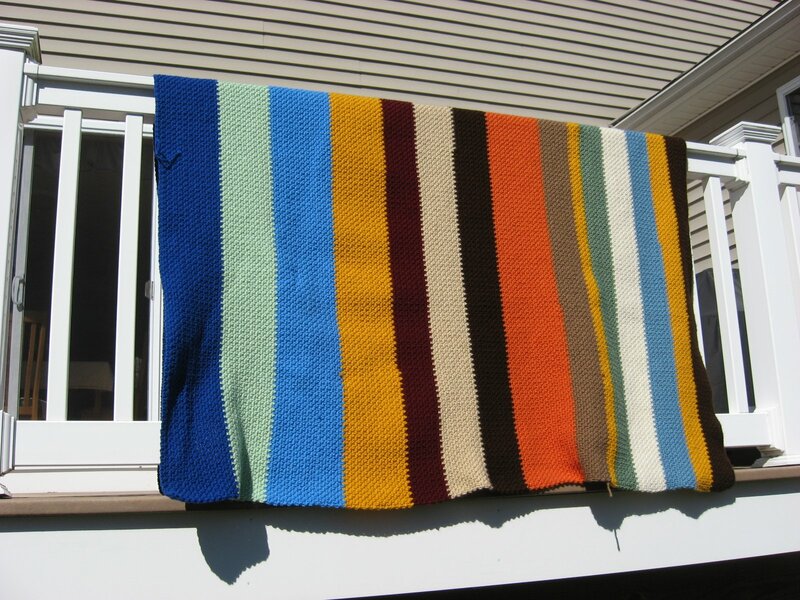 This afghan is hanging over our deck railing on this beautiful March day. The sun is shining and the breeze is cool, but it is already 66 degrees! Summer has arrived much too early for my liking, especially since I was hoping to have this afghan finished before the warm weather arrived! At least it's good for outdoor pictures! The woven stitch is my favorite for scrap afghans and even for planned afghans like those that I made for my two youngest children for their beds a few years ago. You can see pictures of those afghans and others HERE. This afghan is gigantic already and it's not even finished. It measures 56 inches across the top of the railing. 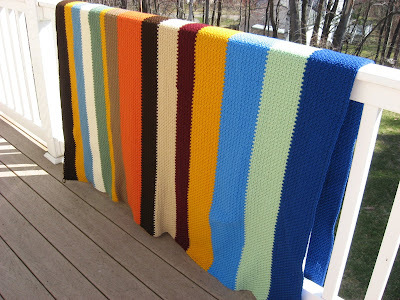 The railing is 36 inches from the top of the deck to the top of the railing and you can see that the afghan is folded over the railing and the afghan touches the deck on both sides, making the afghan somewhere around 76 or so inches long if you figure in the thickness of the railing itself. This afghan will be big enough to cover the top of a queen size bed when it is finally finished! Last night I finished off the royal blue section shown on the left side of this picture. When I pick it up again tonight, I will add in a light blue section, then a magenta section which is almost a whole skein of yarn, and then I will end with a navy blue section which is an entire 7 ounce skein of Red Heart worsted weight yarn! So about another 20 inches will be added to this afghan before I use up my last skein of leftover yarn! Any guesses as to how much this afghan will weigh when complete? Maybe we should have a guessing game and a little prize when it's all finished. That would be fun! 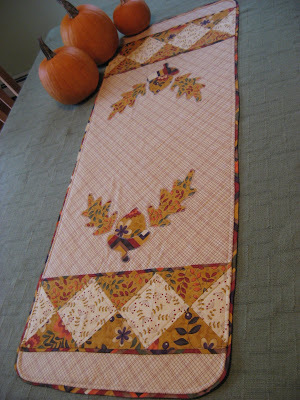 If the weather does what I want it to, and what it should be doing this time of year anyway, and cools down for a few more weeks, I should be able to finish this project and weave in the loose ends, weigh and measure it, and list it in my Etsy shop. So keep an eye out for a fun guessing game as soon as I have all the vital statistics on this project! Wow, you must have had loads of wool stash! 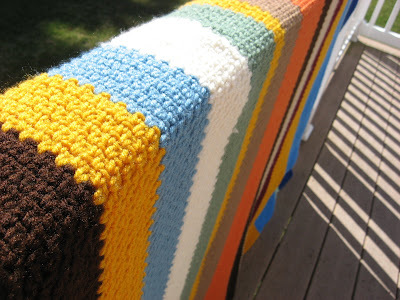 How long has it taken you to make this blanket? It's going to be lovely and warm and I like the colours. 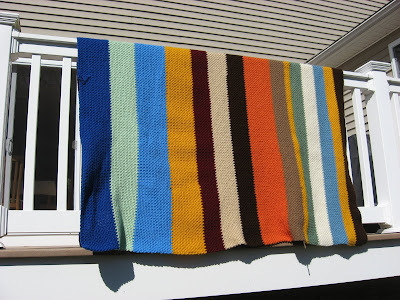 What a great way to use up your yarn - love the stripes. Do you ever rest??? 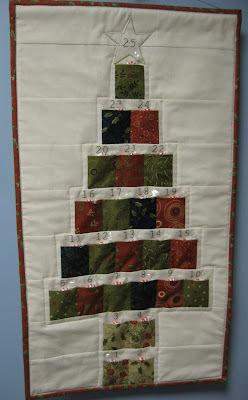 Cathedral Window Pin Cushion ~ Quick and Easy! Fun Fabric Aprons ~ Reversible too!